Forgot Windows 8 password for your Samsung ATIV tablet? Just set up the administrator account on a newly purchased laptop but you couldn’t remember the password now? Well, there is an easy way to remove Windows 8 password without knowing the original one. Just boot PCUnlocker Live CD on the Windows 8 PC that needed the password reset on. After you have booted into PCUnlocker, you can reset Windows 8 passwords for your local or Microsoft account easily. How to Remove Forgotten Windows 8 Password on Samsung ATIV PC? 1) First of all, you need to make a PCUnlocker Live CD using an alternate PC with Internet connection. Download the ISO image of PCUnlocker and burn it to a CD using your preferred CD/DVD burning tool. If you don’t have one, ISO2Disc is a good option which allows you to make a bootable CD or USB drive from an ISO image. 2) Now you can use the CD to remove Windows 8 password on your Samsung ATIV computer. To get the machine to boot from the CD, you need to change the boot order and disable UEFI mode in BIOS. Insert the CD into the disc drive and turn on the computer. As soon as you see the BIOS splash screen, keep pressing the F2 key about once per second until you enter into BIOS Setup. 3) Navigate to the Boot tab, disable the Secure Boot option. If OS Mode Selection is set to UEFI OS, you need to change it to UEFI and CSM OS or CSM OS. Next enter into the Boot Device Priority option and change the boot order, So that the machine will attempt to boot from CD/DVD first, before the hard drive. Save your changes and exit BIOS Setup. 4) This time your computer will automatically boot from the CD you’ve just burned. Just after one or two minutes, the PCUnlocker program will start and it shows you a list of local accounts for your Windows 8 installation. Choose a user account and click on Reset Password button. It will remove / unlock your forgotten Windows 8 password. If you try to reset password for the local account associated with your Microsoft account, the program will assign a new password which could be later used to sign in your Windows 8 Microsoft account. 5) The next step is remove the CD and restart the computer. When you come to the Windows 8 login screen, you can log on with your local or Microsoft account. 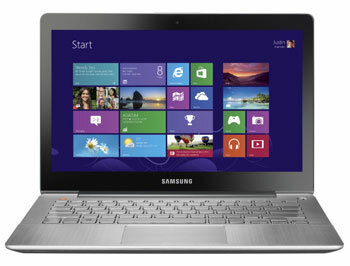 Follow the steps above you should be able to remove Samsung Windows 8 password on your own. If your computer doesn’t support Legacy BIOS and it runs only under native UEFI mode, please use the Enterprise edition of PCUnlocker, which can boot both UEFI mode and Legacy mode. I’ve started to use my old laptop as our main one is currently broken down, sadly I have forgotten my administrator password on my laptop and can’t access the files originally saved in that computer. Another mistake is that I do not have a password reset disk, or what ever it is called. So I have no idea on how to remove Windows password. People often tend to forget their Windows login password on a rarely used computer. Imagine that some day you decide to unpack an old computer and find that you are locked out of the computer, and can’t recall the password anymore. That’s so depressing! Fortunately there is an easy way to remove Windows 7/Vista/XP password if you forgot Windows administrator or user passwords. With Reset Windows Password utility you can remove forgotten Windows password in just a few simple steps. 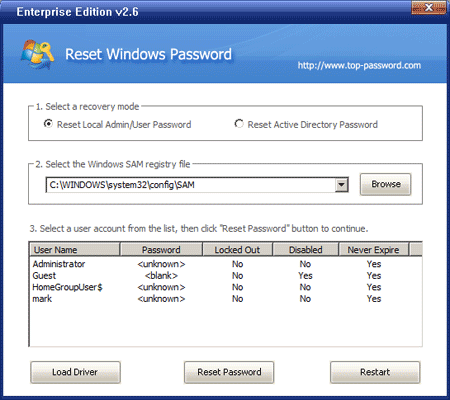 Download the self-extracting package of Reset Windows Password utility. Unzip the download file, then burn the ISO image file: ResetWindowsPwd.iso to a CD or USB flash drive. Insert the password reset disk into your locked computer. Let the computer to boot from it. To do this you may have to enter into BIOS and set CD or USB as the first boot device. It may take a minute for the bootdisk to load some required system files and launch the Reset Windows Password utility. On the main screen of Reset Windows Password utility, you can choose the Windows SAM registry hive. The program will display all user accounts inside the SAM database. Choose a user account whose password you want to remove, then click Reset Password button to remove your forgotten password. How to remove Windows 7/Vista/XP password? You have done it! Reset Windows Password utility lets you remove Windows Admin or user password instantly on all versions of Windows in the event that an Administrator’s password is forgotten or lost. You can log on to your computer again without reinstalling Windows. Forgetting windows login password is not new for the computer users. They used to assign a password in a hurry and then on the next login attempt they forget it. This really can create annoying problems to you. If you are a computer user, you should stay concerned about this aspect. Who knows, this might happen to you sooner or later. There is also instance when password may expire or being locked out and that can also create the same sort of situation. So, what you can do to avoid further problems? When we forgot Windows password, we can’t even get into Windows and install any software to remove the forgotten password. So we need to create a Windows password reset disk to perform password resetting. First you need to download Password Recovery Bundle on another accessible computer, not your locked computer. Install the software, then launch it. Click the Windows Password button, the pop-up dialog will allow you to burn a password reset disk. Insert a blank CD, DVD or USB flash drive, then click Start Burn button to begin the burning process. After your Windows password reset disk is ready, you need to make a litter changes to the BIOS Settings of your locked computer and set CD/DVD or Removable Device as the 1st boot device. Insert the Windows password reset disk into the computer and restart it. It will boot from the password reset disk immediately. When the Reset Windows Password program appears, you’ll see the Windows SAM registry hive and Windows accounts available on your locked computer. Choose your target account, and then click Reset Password button. The program will instantly remove the password, enable and unlock your account if it was disabled or locked out. Now click Restart button and remove the Windows password reset disk, you’ll able to log in to your computer without typing any password on the next login. Forgot Windows login password? This guaranteed way should also be the easiest and quickest way you’ll even use to unlock your computer.